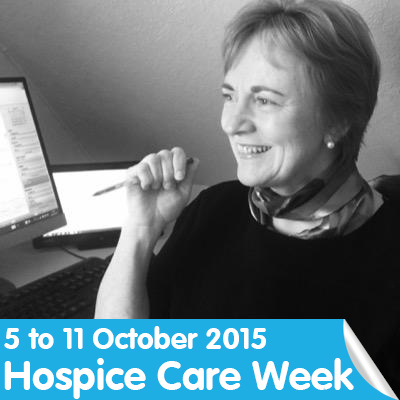 Heather MacLeod is the spiritual care co-ordinator at Wirral Hospice St John’s. As a minister in the United Reformed Church (URC) for many years, her deep belief underpins her vocation to bring spiritual peace to all of our patients and their families, regardless (it’s important to emphasise this) of background, ethnicity, gender, if they have a faith or if they’re non-religious. Heather is just a great person to speak to. I felt it personally after we spent some time together to find out a little bit about her life both outside of and inside the hospice (of which, more later). Heather’s dad, Bert, was from St Helens, and mum, Margaret, from Stirling in Scotland. They met when they were in the RAF during WWII. They were married in secret in 1945. Their love was strong and when Bert was posted to India he made the decision that a career travelling the world would allow less time to be with Margaret, so he left the RAF and moved back to the North West of England. They lived in a flat over a butcher’s shop in Eccleston Street, in Prescot, before moving to a new council house in the town where Heather, and brother, Gordon, were brought up. Margaret was a lady of strong faith and Heather describes being ‘dragged’ to Sunday School from around the age of 3, although, from a very early age, she began to enjoy the lessons and stories she would learn and hear. By her early teens Heather was being put in charge of Sunday School and the midweek youth club in her local community, “mainly because I’m not very good at saying no!” She adds. Leaving school at 17, Heather went to work in the iconic Royal Liver Buildings as a tax officer. She dealt with thousands of employees of large companies such as Guinness and Lewis’s. At the same time Heather was made an Elder at St John’s URC in Warrington. It was during these years, and when visiting family in Scotland, that Heather met her husband Neil. A family get together, where eyes met across a crowded room and, “love at first sight. Well, it was for Neil!” Heather laughs. They settled in St Helens. By the time their children, Kirsty and Mathew (now 39 and 36), arrived, Heather was becoming more deeply involved in the church. The next step for Heather was to train for ministry. When she was ordained as a minister, in 1992, over 300 people gathered to celebrate at Heather’s new church, Marlowe Road URC, in Wallasey. Heather’s church has made a significant contribution to good causes over the years. As well as supporting many local charities, they made a massive contribution to the people of Romania in the aftermath of the fall of the regime of Nicolae Ceausescu. Heather made two trips to Romania. The first time with two tons worth of useful goods and provisions taken to the small mining town of Petrosani. The deprivation was indescribable but the visit meant that they could gather more targeted items for their return, a year later. Bedpans, medicines, heaters and all kinds of provisions for the local school and wider community made a massive difference to these fellow people’s lives. So where, in this full life, did Heather find time to join us at Wirral Hospice St John’s? In the mid 90’s the hospice applied to all the local churches to see if there would be interest for a Chaplain to join us. Heather applied and to her complete surprise, following what she describes as a nervy and challenging interview, she was appointed to the role. She set about the task with relish. She sees her role to deliver spiritual care for ‘everybody’. This is not to say everybody requests, or is compelled, to meet with Heather, but many people do. Heather strives to understand, in each person’s case, what can bring them closer to ‘peace of mind’. This is not always a religious form of spirituality. People find their spirit in family, in nature, maybe in art, sport or music or, yes of course, in religion. Sometimes people just like to talk to Heather, in private or with their families around, reminiscing, about happy, and sad, times. It is frequently the simplest thing that brings spiritual peace. Heather tells me about a gentleman who made it his mission to give his daughter away before he died. Also, the lady who wrote farewell letters to her grown up children and her brother. Then, another lady loved listening to the sea lapping on the shore. Heather arranged a CD with this as background music for the lady’s final days and hours, as she died peacefully here at the hospice. There are innumerable stories like this. They are all part of hospice life and the spiritual service which Heather facilitates with great skill and heartfelt compassion. In our Quiet Space at the hospice Heather has prepared important prayers from a number of faith groups and poems of inspiration, of life and of peace. If families need a break from time to time, because they do experience a whole range of emotions, they can retreat here to be with someone to chat with, or to be alone with their own thoughts. Heather will also provide prayers and for Communion for those who have their faith in Christianity, and refer to other faith leaders for people who use the hospice services and have a different faith. Now, as a retired minister, and outside of her hospice work, Heather is still called upon for her experience and knowledge in the URC. There are also five volunteer assistants, from a number of faith backgrounds. With their own experience and Heather’s guidance, they are also available for patients and their families to meet with. Heather asks me to thank them personally, Veronica, Sister Catherine, Anne, Julie and Barrie, for all that they do for the hospice. Heather is very open and honest. I ask her about a time in her life when she personally turned to prayer as well as the support of medical teams, her family and her wider community to overcome breast cancer. She was diagnosed in 2010 and underwent two lumpectomies that year and then onto a full mastectomy followed by chemotherapy and radiotherapy in 2011. “My church congregation, my family and my faith meant I felt peace throughout the whole time”. Happily, by June 2018, following a number of years of checking, Heather was given the ‘all-clear.’ It’s an emotional thing to discuss and I certainly had a tear in my eye when she smiled after telling me. Like you are, to all of us. Thank you, Heather. After serving 40 years in the health services, 37 as a nurse, Yorkshire born Jill has seen it all. So, how did she choose her profession? “At 16 I didn’t know what I wanted to do. My dad worked as a catering manager at Huddersfield Hospital and he got me a job in the kitchen! I’ve always loved cooking – people at the hospice will tell you about my baking – so I went to college to do a catering course. I really enjoyed it but as I was also working in the hospital I realised that I could do more to help if I became a nurse. I studied at Huddersfield Hospital and lived there, at the nurse’s home, until I gained my qualifications”. Since then a full and varied career has seen Jill honing her expertise to the greater benefit of our patients. Having worked across the whole spectrum of nursing; in operating theatres, in ICUs, gynaecology and, with 22 years as a district nurse in Chester, Jill now pursues her ultimate vocation, palliative care. “Wirral Hospice St John’s is the best place in the world for us to support people, often at the most challenging time for them and their families. Our job is to get people who may be experiencing uncontrolled pain or severe discomfort, as a result of their illnesses, back to their own home environment. Patients come to us at the Inpatient Ward when referred to the hospice by a hospital doctor, GP, district nurse or other healthcare professional. People are generally admitted for, up to, an initial two week period, depending on the progress of their individual illnesses. Patient’s needs; physical, psychological and spiritual, are all catered for so that they can look forward to a return to familiar surroundings as soon as we can stabilise their condition. Once people return home they can also receive our Hospice at Home service which, as well as providing a regular friendly and familiar face from the hospice, supports partners, family members (often 24-hr carers) and other carers to take a little time of their own to tend to their own wellbeing. So while Hospice at Home is with the patient, their carers might be shopping or be able to take a short break for a couple of hours. In her ‘real’ life Jill is happily married to Steve (a retired Psychiatrist) whom she met in her home county of Yorkshire some 40 years ago. She has two children, Rachel and Anthony, who have both blessed her in the last couple of years with her precious granddaughters. Oldest granddaughter, Olivia, is two (she features a little later in this story), while, only 10 weeks ago, Anthony’s partner, Felicity, gave birth to Daisy, granddaughter number two. Olivia has already written her place in hospice history by introducing ‘Granny’ Jill to internet viral sensation the Baby Shark challenge. Jill was so taken by the fun they were both having learning the moves to the song that she shared with colleagues, Infection Control nurse, Chantelle Hardman, Nicola D’Amelio, Clinical Governance Manager and Ward Sister, Clare Norman. It was deemed a fun challenge to get more of the hospice team involved in. So Pied Piper, Jill, gathered up a growing number of willing participants and within an hour or so the music was played, the Baby Shark challenge was met and the video recording shared on the hospice’s Facebook, Twitter and Instagram accounts. It has reached more than half a million people to date, featured on BBC Breakfast, Lorraine and other media channels, including The Daily Mirror’s Facebook page. Another of Jill’s passions is for singing! A proud member of the Chester Operatic Society, she puts her ability to great use for the hospice in early December, helping our Carol Choir to hit the right notes to add to the ambience of our annual Light up a Life switch on service. So, sing it from the rooftops, Jill’s legacy at the hospice is secure. After 39 years as a nurse, Jill tells us that she takes most pleasure in helping younger – her words – staff and nurses to develop into their roles at Wirral Hospice St John’s. She sees her role as helping those people to “get skilled up, to do well and to get on”. What is certain is that the future is bright for Wirral Hospice St John’s if those younger people listen to, and learn from, the ever enthusiastic, Jill Littlewood. We are very excited to announce our new Summer Memories campaign. You can sponsor one of our flowers. These beautiful ornamental flowers will be displayed in bright yellow wheelbarrows around Wirral Hospice St John’s gardens until 31 August. After which, you will then be able to visit the Hospice in early September to pick up your flower, or we will post it out if that is what you have requested. Each flower is locally sourced and is roughly 25cm high, 1cm thick and made out of a high quality resin that will not snap and should withstand all that the British summer has to throw at it. The flower will also come with a label attached on which you can write a dedication in memory of a loved one if you choose. This campaign invites supporters to sponsor a flower and help us raise much-needed funds towards our special care and support of our patients and their families. Local solicitors Kirwans, have very kindly sponsored this campaign, we are very grateful for their most generous support. Flower sponsorship starts at £5 per flower but you can donate more if you would like to. Or, download our form here and return it to: Fundraising Office, Wirral Hospice St John’s, Mount Road, Higher Bebington, Wirral CH63 6JE. For more information please call our Fundraising Office on 0151 343 0778. Over the last couple of years our supporters have taken part in the London to Paris challenge event where they cycled through beautiful English villages into stunning rural France and then Paris and in that time they have raised an unbelievable £8000 for Wirral Hospice St John’s. This year, hospice supporter, Collette Morris will be joining our fourteen strong team. She will be embarking on the London to Paris cycle in memory of her Mum, Sue Oxton following the care she received from Wirral Hospice during her last months. we need to keep the hospice going during 2016 and into the future. Collette hopes to raise an amazing £2000 from her cycle, you can add your support via her Just Giving page. Our team will start with a long journey through rural Kent winding through picturesque British countryside, along the North Downs Way before reaching the white cliffs of Dover. After reaching Calais by ferry, the ride continues past historical landmarks and famous battlefields and through the small villages and medieval market towns of Northern France before ending in Paris amongst the buzz of the Tour De France as the atmosphere builds up for the Grand Finale. Cycling from London to Paris is one of the great cycle experiences in Europe covering over 300 miles in 4 days. With long days in the saddle and some strenuous hill-climbs, the sight of the Eiffel Tower, the finishing point, evokes a real sense of achievement. It is an inspirational and challenging experience to treasure forever. If you would like to take part in the 2016 London to Paris challenge there are still a few spaces left so whether you are a novice cyclist or an experienced rider, simply call Michelle on 0151 343 0778 or email michellet@wirralhospice.org for a full information pack and everything you need to take part in this fantastic event. ‘Connecting Care’ is the theme for this year’s Hospice Care Week, which starts today and is co-ordinated by Hospice UK. This is a topic that we hold very dear here at Wirral Hospice St John’s. One of our greatest aspirations is that people who are reaching the end stages of their lives should receive seamless, wraparound care, freeing them from worry and concern as they try to access different services. We want people to understand that the work we carry out, although specifically for people who need palliative care, is an integral part of the services available to the community, and Hospice care reaches out to not just patients but families and carers too. Our Hospice is a micro-community in its own right, and is unashamedly tapping into the current move to enjoy creating and tasting delicious things. We’re having our very own ‘Bake Off’ on Sat 10 Oct, when staff and volunteers are pitting their culinary skills against one another to produce a winning confection. Please come along and try out the entries – make your own judgment too – between 10am and 2pm, and take the opportunity to see the Hospice. John Bear, Wirral Hospice’s mascot, is rumoured to be coming, and you know what bears are like when there’s cake around!